General Astronautics, its officers, and its employees are dedicated to being a part of the effort to move humanity into space in the Twenty-first Century. We want to share our vision of things to come, and to make it possible for people around the world to participate in the coming events. Other organizations also provide information and a means of participation in space-related activities. The Planetary Society, in Pasadena, CA, focuses on the scientific exploration of space and sponsors actual projects such as those for Mars exploration, the search for Earth-approaching asteroids, and the search for extra-terrestrial intelligence. The National Space Society, in Washington, DC, focuses on human activities in space, taking an activist role. The Space News Web site provides current news and almost 200 links to other space-related sites. The close of the Twentieth Century bears some strong resemblances to the close of the Fifteenth Century. Just as the voyages of Christopher Columbus showed the members of Western Civilization that a new frontier had opened up to them, telescopes, rocket technology, and human and robotic explorers have shown us that our solar system is a frontier that is now becoming open to us. The Twenty-first Century, like the Sixteenth, will be one of exploration, experimentation, and risk-taking as people leave their homes for freedom, fame, and fortune. As in the past, it will be a time of intellectual excitement and high investment returns even for the people who do not chose to leave their homes. The entire human species will experience and benefit from what a small part of the population does beyond Earth. This century will see the first opening of the New Lands beyond Earth. The manner in which people move into space will strongly influence the future for a long time to come. A private, commercial approach will create the most opportunity for individuals and a sustainable enterprise base to assure a permanent presence. When the New World opened up for Europeans, people could take advantage of the opportunity to create new homes for themselves because transportation was affordable and they could earn a living in this new home as farmers and workers. Likewise, space will become a place where people can create new homes when transportation and haven are available and affordable, and when it is possible to earn a living in the New Lands. Only individuals and private enterprise will create the New Lands beyond Earth; governments have no interest in doing so. As a government-controlled project, the NASA Space Shuttle (the STS) was an immense technical challenge, an operational behemoth, and an economic disaster for space exploration. Its expense and operational restrictions resulted in curtailment of space science and inhibition of space commerce. 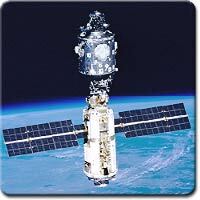 The International Space Station (ISS) was another product of the same government bureaucracy. Both the Shuttle and the ISS are intended for government employees; they are not for private citizens. In fact, nothing done in the past half century of government space developments has been to directly benefit people. Private ventures, by their very nature, use capital voluntarily provided by interested people. These investors provide funds in order to be part of creating a new human future, to receive privileged reports and pictures of the progress resulting from their investments, and to reap the financial rewards of their successful investments. What has been lacking in the past half century has been a mechanism by which people could make investments in specific space ventures. It is now possible to do so. The following scenarios are more likely to be completed as private ventures rather than as government projects. Governmental inefficiences, coupled with the looming fiscal crises facing governments in the coming decades, are making it both possible and necessary for private citizens to directly support and participate in private, commercial ventures. These scenarios are important parts of the future which humans can, and should, create. As in all such human endeavors, knowledge, capital, and hard work are the essential ingredients. Permanent, automated platforms in low Earth orbit can be used for a wide variety of purposes, including processing materials, observations of Earth and space, and communications. These platforms can be serviced by people and robotic servicers. Several specific designs were developed in the 1980s, but were never carried forward for lack of government interest. Platforms can have substantial advantages over larger, permanently staffed stations. Skylab, Mir, and the International Space Station are the forerunners of stations developed to meet commercial and scientific needs. Permanent space stations developed for specific applications can have development and operating costs far below the ISS, and have the potential for being highly profitable facilities. Profitable operations will provide the basis for the continuous presence of people in space. As operations expand, permanent space stations can serve as prototypes, or even core structures, for the first human cities in space. Commercial space stations will have roles as manufacturing centers, science research centers, and tourist sites. These facilities are likely to be developed as joint ventures by established companies, and also allow private investors an opportunity to participate in the ventures. The International Space Station has two modules connected in orbit. The third module may be attached in mid-2000. 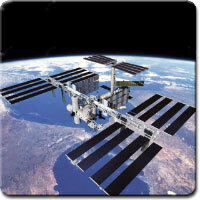 The ISS may reach completion in 2004, approximately 20 years after its start. The Mir station was scheduled for de-orbit in mid-2000, but commercial backers might be able to keep it in service. The Chinese government is reportedly interested in purchasing Mir. Beyond artificial structures for stations and space cities, the planets are the next likely locations for new cities. The planets may provide the most economical locations for human settlements beyond Earth. Mars, Mercury, Luna, and some of the outer planet satellites are likely to be the only feasible planets for settlement in the coming century. Mars has many obvious advantages over Luna and Mercury, especially with its atmosphere, apparently enormous quatities of water, and wide variety of resources. Its atmosphere, however, is so thin that people on the surface must wear pressure suits, its small portion of oxygen will not support life even when the pressure is increased, and over most of the martian surface water cannot exist as a stable liquid. Recent indications of water ice at the poles of Luna and Mercury have important implications for the presence of people. Sources of water on these bodies could make settlements practical. Asteroids and comets could be of major importance in the development of human settlements in space because of their resources. Mining these bodies could be the lowest cost method of obtaining resources. These small bodies could themselves be potential sites for towns and cities, especially if substantial mining operations are established on the bodies. Recent spacecraft encounters with three asteroids have provided our first looks at these bodies. Over the coming years, spacecraft will orbit and land on asteroids and comets to conduct analyses of their content and to send samples to Earth. As part of the paradigm shift away from government to private projects, privately-owned spacecraft will be going to Earth-approaching asteroids. In addition to scientific analysis and samples, the presence of these spacecraft can form the basis for claims of mining rights. Later spacecraft, which are larger and more capable, can begin mining operations. Resources brought from these asteroids to Earth orbit can be important factors in the development of infrastructure in Earth orbit. Communications appears certain to remain a major, or even dominant, commercial activity in space. Large, new constellations of communication satellites are expected to be created in the next few years, particularly in low and medium Earth orbits. Spacecraft in the high, geostationary orbits may continue to dominate the communications market for the foreseeable future. If crowding conditions worsen over the coming years, individual spacecraft may give way to communications platforms so that specific sites can support a wider range of services. Solar power satellites remain a possibility for the future, with the potential to revolutionize power generation and delivery. These satellites could have a major impact on our civilization by stemming the depletion of fossil energy sources and reducing atmospheric pollution without the problems of waste disposal associated with nuclear power. It is possible that within a century nearly all electrical power generation and vehicular fuel production could be based on solar power satellites. A debate began in the 1950s on how to lower the cost of transportation into Earth orbit. Two approaches were considered: the use of low-cost expendable rockets or of expensive, but reusable rockets. Both choices still have their proponents. The total cost of transportation to orbit is a combination of development cost and operating cost. A rational approach to lower costs recognizes the necessity of reducing the total cost, not simply the operating cost. The government plus government contractor complex has preferred the option of using expensive reusable vehicles. The public was told that NASA's Space Transportation System (the Shuttle) would cost $20 million per launch; its actual launch cost is at least $400 million, possibly as high as $1 billion, depending on the accounting method used. This results in a cost per unit of payload mass greater than the expensive expendable vehicles currently in use. It also ignores the amortization of development and design improvement costs, which would add roughly $100 million to the cost of each launch. The current effort to develop a replacement for the Shuttle centers on the X-33 test rocket. The X-33 is a suborbital test rocket; it will not be capable of reaching orbit. The government is providing $941 million for the development of the X-33. Development of an orbiting vehicle derived from the X-33 would cost additional billions of dollars. NASA management has stated that industry must provide the additional development funding. If private capital is used, the development costs would have to be amortized and included in the launch cost charged to the user. Treating this in a realistic manner, the true cost of a launch appears likely to be at least $100 million, which is a minimum of about $5 million per metric ton of payload. Effective low-cost expendable rockets rely on simplified designs, which yield three key results: low development cost, low operating cost, and high reliability. Unfortunately, the arrival of the Space Shuttle concept, which was seen in the late 1960s as the answer for reducing high launch costs, combined with aerospace industry concerns about the loss of launch vehicle production profits and combined with a general inclination and desire for high technology solutions, has prevented the MCD [minimum cost design] approach from moving off the paper stage to flight hardware. It is time to seriously explore the application of minimum-cost design techniques for developing a new low-cost launch system - a system that could facilitate a broad expansion of space exploitation activities. General Astronautics is developing its Urania launch vehicle using essentially the same technology and basic design approaches used in those earlier studies. It is applying its own proprietary design concepts to make the vehicle even more affordable. The development and operation of Urania will be a fully private enterprise. The development of space for the benefit of people depends on available, low-cost transportation to Earth orbit. When such transportation is available, commercial facilities can be constructed and people can begin moving into space to new homes and new jobs. All the scenarios described in this section depend on available, affordable transportation to Earth orbit. It is the essential first step. Chemical and nuclear rockets have long been favored for interplanetary transportation, but there are low-cost alternatives that seem likely to come into use in the Twenty-first Century. These include solar electric and solar thermal propulsion, and solar sailing. Commercial interplanetary transportation companies could develop and operate transportation systems based on these technologies.